big brother Selvaraghavan’s direction, Puduppettai is nearing completion. Meanwhile, he has started shooting for Asokamitran under Karu. Pazhaniappan. 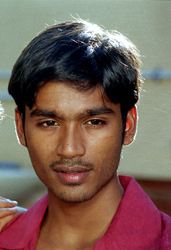 Yesterday, Dhanush, his wife, Aishwarya and his mother were spotted at Prasad Studios in the evening. They had come for a sneak preview of Adhu oru kanakkalam. The screening was held just for them.